Most voters continue to say it is important for a president to have strong religious beliefs. 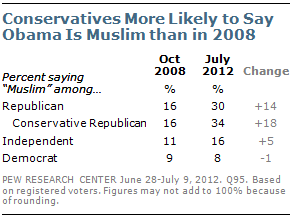 But voters have limited awareness of the religious faiths of both Mitt Romney and Barack Obama. And there is little evidence to suggest that concerns about the candidates’ respective faiths will have a meaningful impact in the fall elections. The latest national survey by the Pew Research Center’s Forum on Religion & Public Life and the Pew Research Center for the People & the Press, conducted June 28-July 9, 2012, among 2,973 adults, including 2,373 registered voters, finds that 60% of voters are aware that Romney is Mormon, virtually unchanged from four months ago, during the GOP primaries. The vast majority of those who are aware of Romney’s faith say it doesn’t concern them. Fully eight-in-ten voters who know Romney is Mormon say they are either comfortable with his faith (60%) or that it doesn’t matter to them (21%). Along religious lines, white evangelical Protestants and black Protestants, on the one hand, and atheists and agnostics on the other, are the most likely to say they are uncomfortable with Romney’s faith. Yet unease with Romney’s religion has little impact on voting preferences. Republicans and white evangelicals overwhelmingly back Romney irrespective of their views of his faith, and Democrats and seculars overwhelmingly oppose him regardless of their impression. Comfort with Romney’s faith, however, is related to the enthusiasm of Republican support for his candidacy. Among Republican and Republican-leaning voters who say they are comfortable with Romney being Mormon, 44% back him strongly. Among those who are uncomfortable with it, just 21% say they back him strongly. The new survey on religion and politics finds that nearly four years into his presidency the view that Barack Obama is Muslim persists. Currently, 17% of registered voters say that Obama is Muslim; 49% say he is Christian, while 31% say they do not know Obama’s religion. The percentage of voters identifying Obama’s religion as Christian has increased since August 2010, from 38% to 49%, while there has been little change in the percentage saying he is Muslim (19% then, 17% today). Still, fewer say Obama is Christian – and more say he is Muslim – than did so in October 2008, near the end of the last presidential campaign. The increase since 2008 is particularly concentrated among conservative Republicans, about a third of whom (34%) describe the president as a Muslim. Overall, 45% of voters say they are comfortable with Obama’s religion, while 19% are uncomfortable. Among those who say Obama is Christian, 82% are comfortable with Obama’s religious beliefs. Among those who describe him as a Muslim, just 26% are comfortable with his beliefs. The survey also finds continued public ambivalence about the role of religion in politics. Fully 67% agree “It’s important to me that a president have strong religious beliefs,” an opinion that has changed little over the past decade. And more than half say they are comfortable with politicians expressing their religious beliefs. Yet the public remains opposed to churches explicitly endorsing political candidates, with two-thirds saying churches and other houses of worship should not come out in favor of political candidates. And a Pew Research Center survey released in March found that concern about too much church involvement in political matters has been on the rise over the past decade. 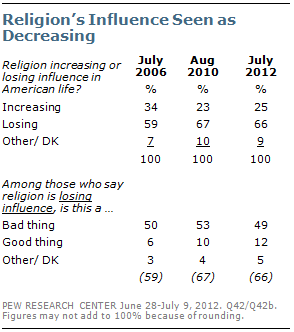 The new survey also finds that 66% of the public says that religion is losing its influence on American life. That is little changed from 2010, but among the highest percentages saying religion is losing its influence since the question was first asked in a Gallup poll in 1957. A small but growing share of Americans say it is good that religion’s influence is declining: Currently, 12% say this, up from 6% in 2006.